I Think Everyone Should Get At Least One Letter Like This In Their Lifetime. 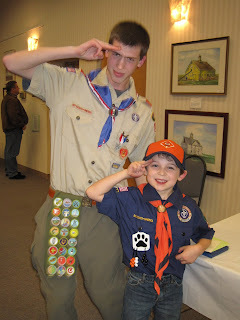 One of my favorite pictures from the older boy’s Eagle Scout Court of Honor last year is this one, of him and a little boy he used to babysit. So cute, right?? *Even though I can’t be there when he reads it, I’m thrilled that his mom was sweet enough to scan the letter and email me a copy! Aww! One for the memory box/bulletin board! Super cute. that is ABSOLUTELY PRECIOUS! I bet the older kid LOVED it! Wow! 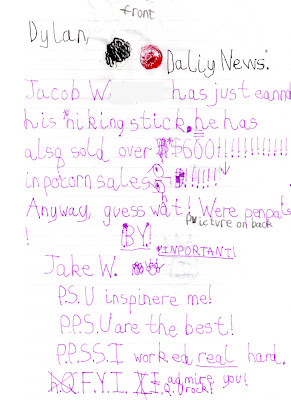 What a great letter! I bet your son loved it! Your son certainly made a difference in that young man's life. That is, hands down, the best letter I have ever read. Also, it's possible that it made me feel like a schmuck for only selling $90 worth of popcorn. Wow… you can get a lot of accolades in your life, but none could make you this proud. How cool is it that he's someone's role model! Great job! That is SO awesome. Make sure he never ever ever throws that letter away! That is so very cool. I got all teary reading that. A letter like that is frame worthy. That's probably the most sweet and sincere letter he will ever receive. that's awesome. can i just tell you how hard it is to sell 600 of popcorn in this economy if you don't have a job where you can hit people up! to me this embodies everything scouting is SUPPOSED to be. but obviously scouting can't take all the credit (or our pack would have better behaved kids) so I think speaks volumes to what great parents he has. That is so cool. The picture is priceless. One of my husband's best friends was an eagle scout and now works at the boy scouts headquarters. I was admiring his badges the other night. The letter is sweet. Is it sad that the teacher in me cringed when I saw that he used "u" ? Sweet nonetheless, would love to hear how he reacts. That is fantastic. I'm so glad you shared it (and linked to it!) Thanks. What a wonderful level of appreciation he has at such a young age. I'm sure that letter went right to your son's soul. Previous post: What Does Christmas Have To Do With a Tornado?